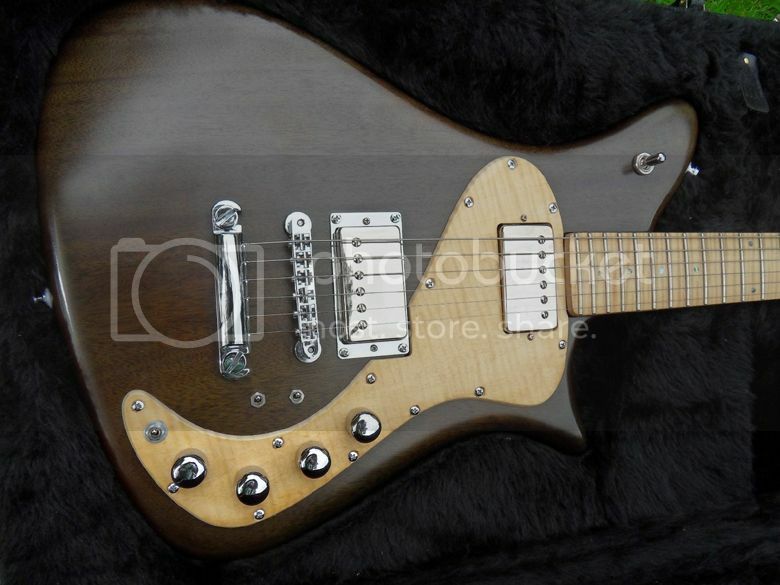 Here's an intriguing German-made guiar currently listed on reverb.com with a Buy It Now price of US $1,400 + shipping. It's a Migma Favorit, according to listing made by Heinz Seifert (?) if I am reading that correctly. It's supposedly from 1960, in which case it would have pre-dated the Vox Mark IV (a.k.a. Teardrop) by three years. I guess the shape might have been based on that of a lute - it would seem to be the obvious genesis for this design. 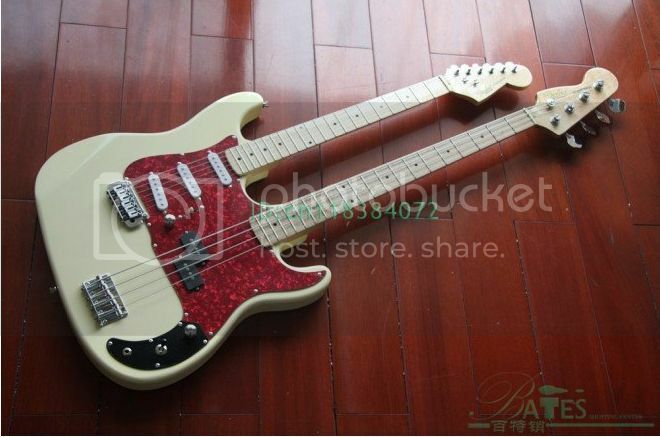 The example being sold here is obviously missing a pickguard, which would have hidden the enlarged part of the lower f-hole. I'm guessing it was made that way as an easier way of getting the pots in place during assembly. And just to prove that this is a playable guitar, here's a video of Linas Pečiūra playing "Corcovado" on this very instrument. Regular Guitarz readers will know of my fascination for doublenecked guitars. 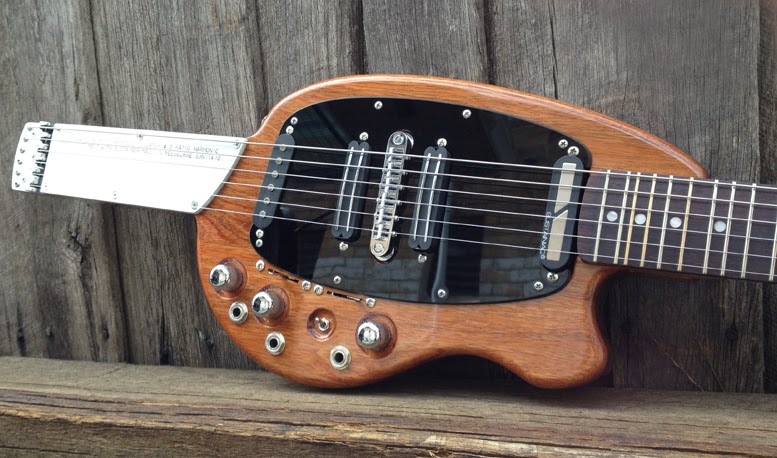 They will also know of my fondness for the absurd, and when it comes to travel guitars what could be more absurd than a doubleneck guitar? This rare Pignose 12+6 Doubleneck Travel Guitar, built solely for the Japanese market, features the now legendary Pignose amp built into the guitar body plus TWO speakers. I admit that I never saw the point of a doubleneck combining 12-string and 6-string necks (realistically, how often would you want to play both on the same song? ); as I have commented elsewhere I don't understand why there aren't more bass + guitar doubleneck combinations, or for that matter, doublenecks featuring a pair of six-string necks which would allow for alternative tunings. Despite all that, if you did actually want that 12+6 combination, this Pignose does look like it has a nice compact body and shouldn't be the backbreaker that certain doublenecks are known to be. Currently listed on eBay with a Buy It Now price of US $775.00. 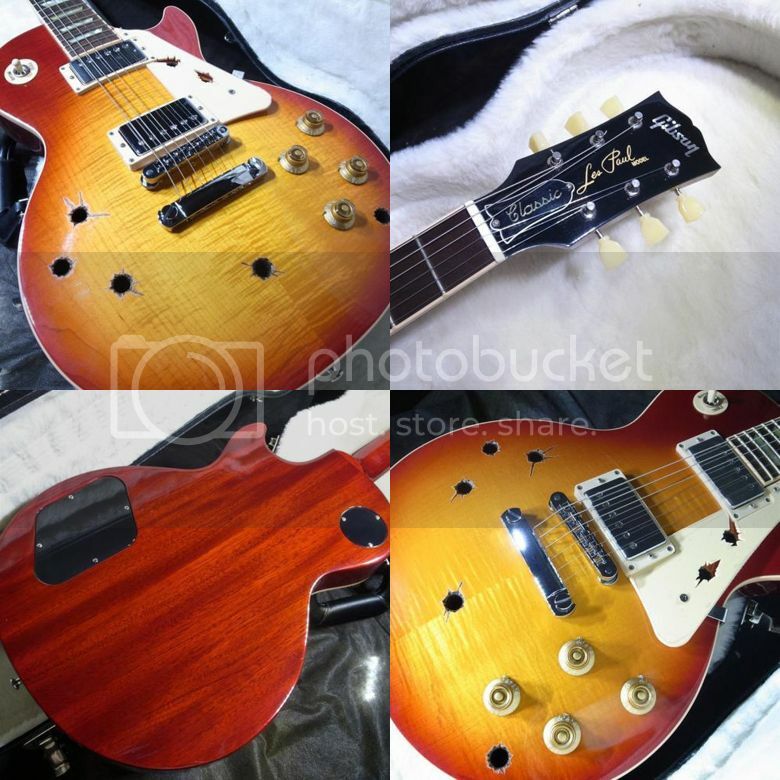 Gibson USA "BECK: Lucille" Modified (allegedly): see if you can make sense of the item description! Among the artists-modify our Les Paul here which is the work of a different color is: "BECK Lucille" modifier! ! I have made based on the Les Paul Gibson Co., Ltd. is a well-established long-established in about said that this unit Lucille, and people do not know is in the guitar brand. It is one that can be highly recommended for those who are interested in Lucille, it is beginning the guitar now. You can be able to help playing pounding of course, to enjoy enough even if I decorate! ! Clothed in the body the gruesome anecdotes as if to symbolize the one side of the lock, the unit that appeared in the manga BECK is a vivid shine as one of the icons of modern rock guitar, yet the product of a virtual We alone! ! Reproduces closely vivid singe bullet holes and the Lucille and to failure of the escutcheon and pickguard further as if telling the shock, our shop has built up a single realistic. You do up here also only shop. If you were looking for one to make eye wacky, please consider as soon as possible. Visit us, we are waiting for your inquiry. I think it's safe to say that something has been lost in the translation there. I believe that this footage is currently going viral in guitar-related blogs and Facebook pages, but unlike a lot of the viral nonsense, it is worth viewing. Although the Jackson Steel SlideKing Bass looks like a slide guitar or a console guitar (seeing as it's on legs), it really falls under the category of pedal steel as it has four pedals to change the pitch of the strings. The SlideKing Bass retails for $1,995.00 + $250 for a case (apparently they won't ship it without a case, so I don't know why they have separate pricing as if it's an option). 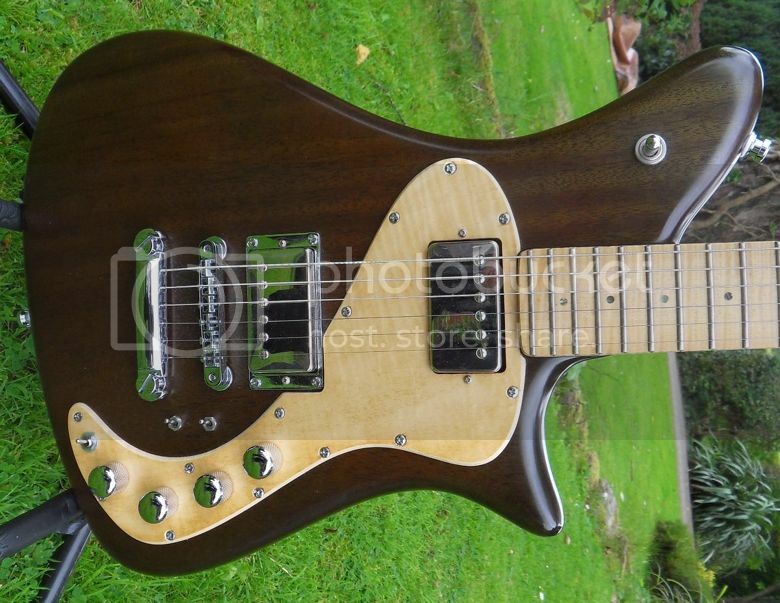 ...it would look like this, the TeleBacker, made in the USA by Banning Guitars custom shop. The example in the photographs reproduced here is currently listed for sale on eBay with a Buy It Now price of US $1,899.99. 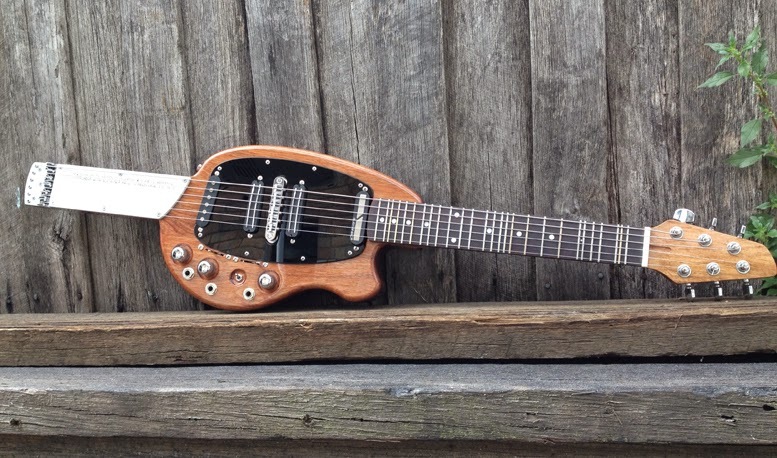 Here's an intriguing prototype guitar, the result of a collaboration between Dan Armstrong and Westone Guitars. It's a Westone Dan Armstrong Signature Series "Shark" prototype from 1991. The guitar features a licensed Floyd Rose tremolo, Dan Armstrong Mini humbucker and Dan Armstrong Monster triple-coiled pickups mounted on a body that is somewhere between a Stratocaster and a Mustang in design. For more information please see: www.danarmstrong.org/westone.html, www.vintagesilvertones.com/forsale_westone_dan_armstrong.html and www.westone.info/danarmstrong.html. Currently listed on eBay with a very reasonable sounding Buy It Now price of US $499. Doubleneck guitar and bass project - your ideas and help wanted! 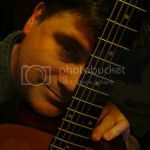 I've been mulling over ideas for a guitar that I have decided I need in order to reproduce in a live situation the music I have been making in a couple of projects. This past year I have taken to the bass guitar in a big way, so much so that it has become my main instrument. 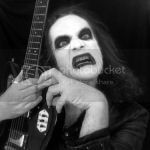 However, I still want to play guitar as well, but more than that what I'd really like to do would be to play both bass and guitar on the same songs. So, what is required is a doubleneck guitar and bass. Add in a looper pedal (or preferably two) and the possibilities are quite staggering - just check out what Kristian Dunn does in El Ten Eleven (see video clip above). However, finding an off-the-shelf solution to a doubleneck guitar/bass combination is not so easy. Most such instruments I can find have the bass neck at the top and the guitar neck at the bottom. I can understand the logic at work here so that you have the strings across the entire instrument running from low to high, but I believe that this is not the best practical arrangement. Just think about it. For starters I'd have thought that having the longer bass neck at the bottom of the instrument would allow for better balance. But there is also the question of playability. With a bass on top you would need to rest your forearm across the longer scale bass strings in order to reach the guitar side, which could lead to unwanted damping or spurious noises from the bass if the volume for both necks was on at the same time. Also, for chordal work / strumming on the guitar I'd rather have that higher up on my body, whereas for playing bass I'm personally happier to have it slung a little lower. So, yes, for me bass on bottom is definitely the way to go. In which case, what options are there? 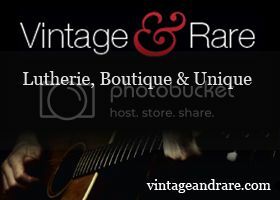 Well first off there are vintage instruments like the Shergold doubleneck and Danelectro examples pictured here. Even better would be the Carvin DB630 as used by El Ten Eleven's Kristian Dunn. It's definitely one of the better doubleneck designs I have seen; it looks a lot less cumbersome than most. Alas, these vintage instruments are all quite rare and not very easy to track down. In the event of actually finding one for sale, it is liable to be expensive. Did I mention that my budget is limited on this project? Quite frankly, the less I can get away with spending, the better. OK, so how about a cheaper instrument from China or Korea? There are a number of websites that feature such instruments for sale, some of which have very cheeky copies of certain big brand American guitars complete with counterfeit logos, whilst others are variations on designs from those same companies but are guitars that never existed. In this latter category are a number of doublenecks. 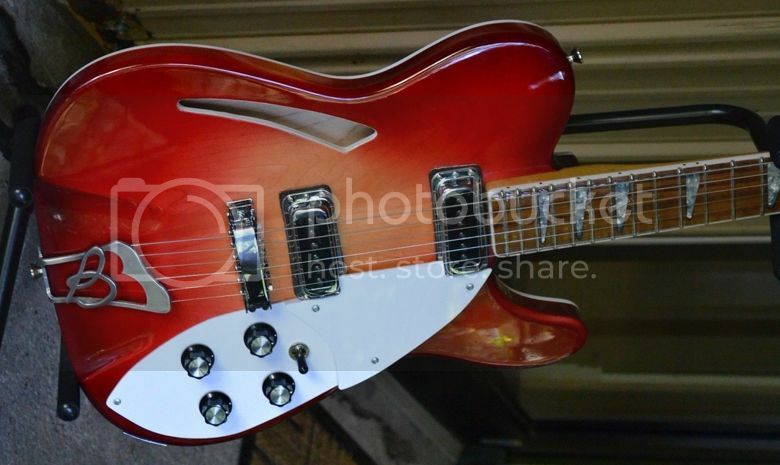 For example, this Rickenbacker 6+4. 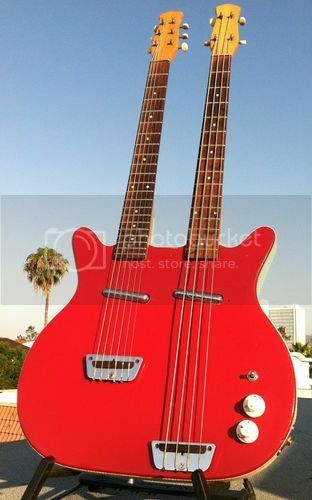 (Note that Rickenbacker's own 4080 doubleneck model had the necks the other way around with the bass on top). 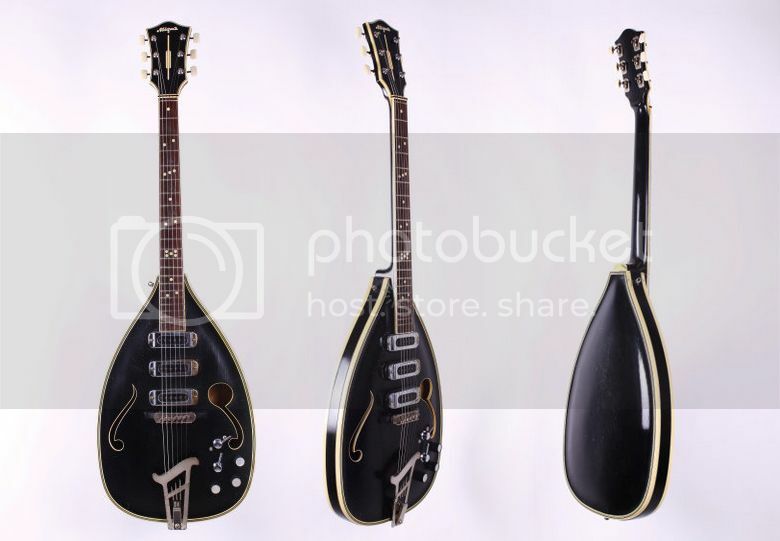 However, even though the Far-Eastern made Rickenbacker-influenced doubleneck has the necks in the correct formation for my requirements, just look at the size of that thing! It's much more cumbersome than I would prefer. 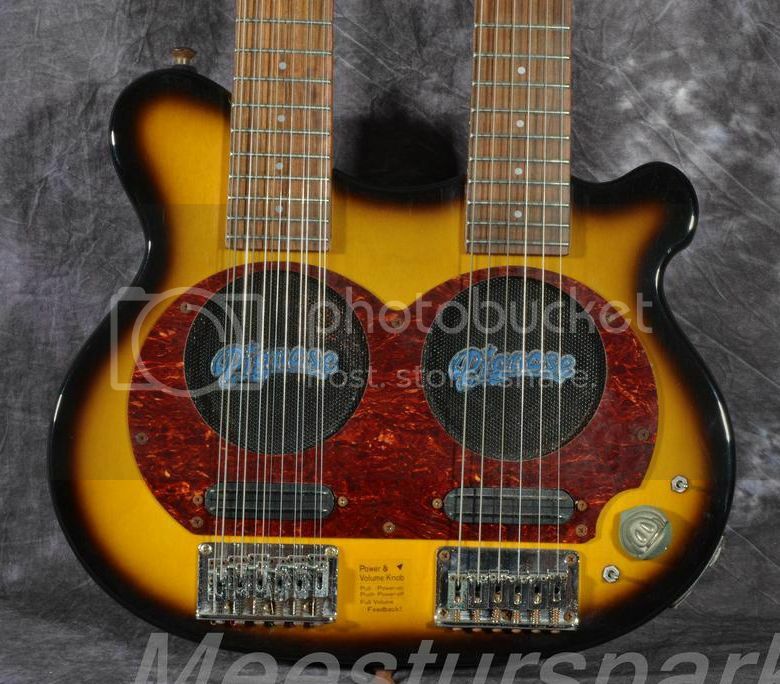 I also found this Steinberger-like headless doubleneck 6+4. With a compact body and no headstocks it shouldn't be too cumbersome. However, I could find zero information about it and looking at the photos I couldn't tell if if had one output or two (that would be ideal - an output for each neck). Looking at the control layout, I can't see any selector switches, not just for the pickups but for each side of the instrument. The use of volume controls alone would not be convenient - you'd have to raise the volume on one side of the instrument and lower it on the other. A simple switch is what is required. Furthermore, when wondering how well it would balance on a strap, I checked all the photos I could find and couldn't even see any strap buttons. It does look to be a very cheaply made instrument. Yes, I wanted cheap, but even so I would prefer to have all the basic hardware you'd expect. The only other doubleneck 6+4 that I could find (that is, with the guitar uppermost and the bass beneath) was this Strat/P-Bass combination. 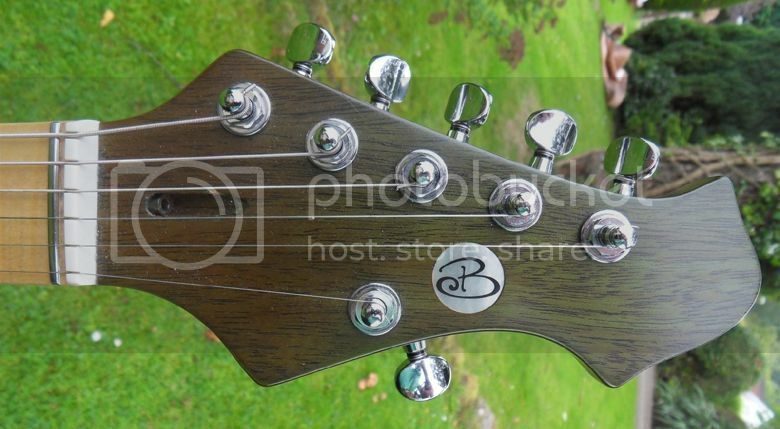 I liked this design very much and particularly liked the reverse headstock on the bass side which neatly gets around the problem of the tuners getting in the way of the opposite neck. Maybe it's a little more cumbersome than I should be aiming for, but it would indeed look very cool on stage. However, it appears to be a discontinued model and I simply couldn't find an example for sale. Quite frustrating. OK, other options would be to commission a custom-built instrument but I've already explained that this is a budget operation, so that leaves the DIY route. 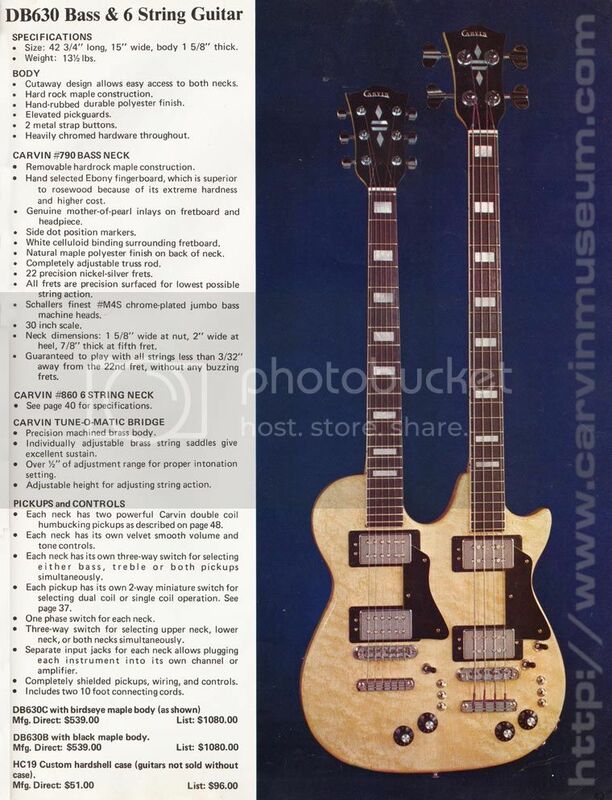 Well, I've checked the doubleneck guitar kits available and can only find a 6+4 with the bass on top. Bertram's advice to me is "try my way - cut two Squiers in halves and have them glued together by a pro." 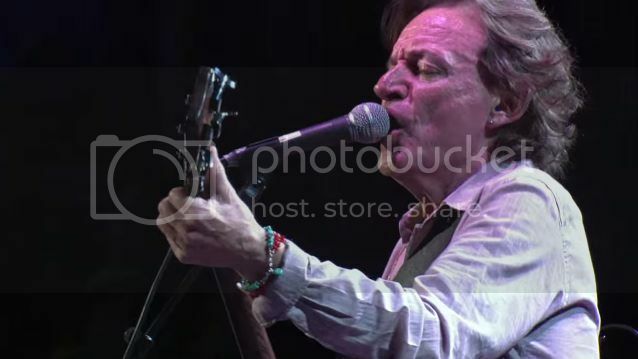 He's referring of course to his Doppelcaster, the doubleneck Telecaster that he built. 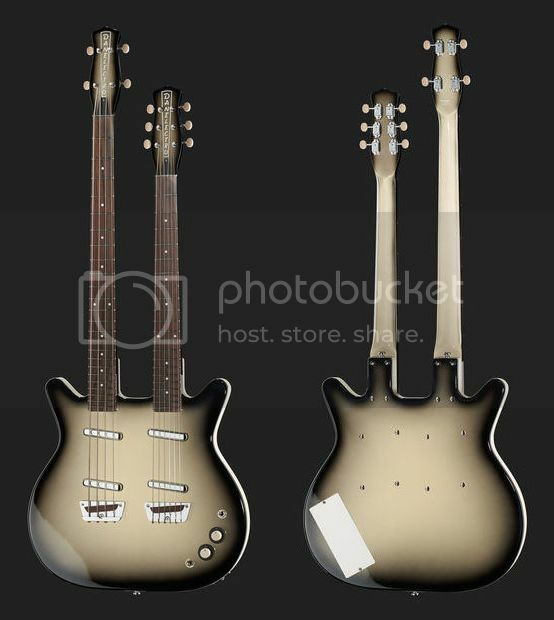 That is indeed one option, but if I wanted a doubleneck like the last one pictured above, joining a Strat body to a P-Bass body isn't quite so simple as the latter is a longer shape (remembering that I want the bass at the bottom). Then of course there is the body contouring to take into consideration. Slab-bodies would join together much more easily so maybe as Bertram suggests I should think Telecaster rather than Stratocaster. Ibanez GAX30 guitar and Ibanez GAX150B bass. But what do you know?... The GAX150B is now discontinued and no-one seems to be selling them on eBay either. Hofner Shorty guitar and Hofner Shorty bass. I thought this might allow for a nice compact design but I couldn't quite work if it was feasible to chop portions of the bodies off and join then together. There didn't seem to be quite enough material to work with. I did momentarily toy with the idea of NOT chopping down the bodies but connecting the two together with metal rods drilled into the bodies. However, I figure this would mean that the two necks would be too far apart from one another. Epiphone LP Junior/Special and similar bass. As long as both were slab-bodied and of the same thickness, this could work, but I simply haven't found the necessary donor guitars for sale. So maybe what I want to do is to take parts from a couple of donor guitars and have a new body constructed to accept the donor necks and hardware. I'm quite happy to use my cheapy no-name Chinese Telecaster for parts but haven't yet got a donor bass - I was wondering about a Squier Bronco bass maybe? So now I'm going to be rather cheeky and ask if there are any Guitarz readers out there who would be willing to help me with this project? 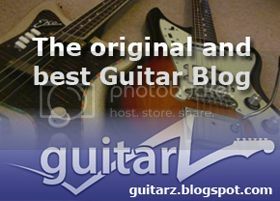 (Hey, I may as well take advantage of having this guitar blog!) I neither have the resources or the talent so I'm going to ask: Would someone out there be able to build me a doubleneck body? I'm more interested in function rather than it being a superb piece of first class luthiery. Obviously I'd be willing to pay but I'm not able to pay custom shop prices. It'd probably be best if it was someone in the UK or maybe Europe, so as to minimize the cost of sending parts and materials back and forth. I am open to suggestions but at the moment, I believe what is required is a new body routed for Telecaster parts on the guitar side and probably a P-Bass on the bass side (or possibly a Squier Bronco bass - the shorter scale may make for a better balanced instrument). 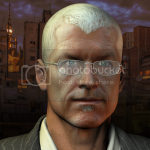 As to the design, that is something we could discuss further. Please contact me by email (gavinlloydwilson@yahoo.com) or else via the comments below. If anyone else has any ideas which might be useful please feel free to add to the discussion. Additional: Someone has suggested that I simply buy one of these and swap the necks around. I wonder if it might be as simple as that? 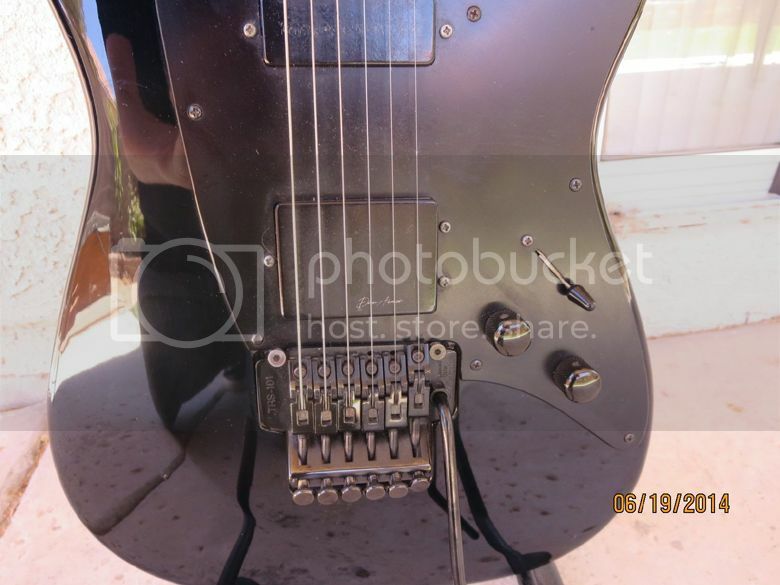 I can see that the bridges and pickups are in the same positions but would the neck pockets be the same size? This Becker Retro guitar reminded me of some of Bertram's original drawings for his guitar designs as seen on his Guitarren blog. Becker Guitars began in 1995 as a repair shop in the basement of founder Dan Becker. After its first years of operation, Becker Guitars moved to a new shop in Stoughton, Massachusetts. While the company grew into a full service guitar repair and restoration center, Becker began venturing into guitar making. 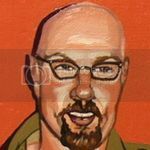 In the spring of 2006 Dan Becker, brought on Maine guitar luthier Ryan Martin and began to focus on designing and producing custom instruments. Becker soon moved from its smaller shop in Stoughton, Massachusetts to a larger space in Attleboro, Massachusetts in order to accommodate a growing production line. In 2007 Becker unveiled their first prototype, an Imperial model, to the public at the first annual Premier Guitar Festival. 2008 saw the release of Becker Guitars' flagship production line, The Retro Series. First introduced in 2008, The Retro Series is our flagship guitar line. This model features a mahogany body which is contoured to maximise comfort and ease playability. The neck is also mahogany, with a Flamed Maple fretboard, 16 inch radius, 22 stainless steel fret. Gotoh machine heads. An interesting feature is an additional “zero” fret (see photo) to allow closer control of string tension and also allows for much lower action. The action on this model is very low, making it an incredibly fast neck indeed. The neck is topped off with a bone nut. The Pickups are incredible - Lindy Fralin Hot Humbuckers, each of which is coil tapped (separate switch controlling each), to make a huge range of tones available. Pickups are selected via a three-way toggle switch (Neck, Neck/Bridge combined and Bridge). There is also a “kill-switch”, so cancel all output when required. All-in-all, this is a top specification guitar, hand-crafted using the best materials available, extremely flexible with great playability. The body colour is Kiwi Green and it has a Satin Nitrocellulose Lacquer Finish. The wooden pickguard is made from the same flamed maple as the fingerboard, so there is no “plastic” feel to this instrument whatsoever. (Text probably originally from Becker Guitars themselves). Currently listed on eBay UK with a Buy It Now price of £1,450. A few months ago I presented two guitars by Australian small company New Complexity (the Contra and the Harmonic Master) - they just released their new model: the Harmonic Isolator. As you can see, this is once again not a standard guitar but almost a new instrument that allows harmonics to fully develop for each note played - on its specific scale. The pickups before and after the bridge (and optional sustainer) have their own outputs and can be amplified and effected independently - you can hear what it sounds like on the video down here.